In a world where superheroes are real, Thom dreams about joining The League, a band of A-list good guys who protect the citizens of their fair city. He also dreams about one of the most famous (and dreamiest) superheroes, Uberman. Thom's keeping a lot of secrets, not the least of which is that he's got superpowers and has been invited to try out for The League. He knows his dad would flip if he found out. His dad used to be a hero, one of the greats, but then he was maimed in a catastrophic accident during a rescue mission that went terribly awry. Now Thom's dad is a pariah and blamed for hundreds of deaths. He's sworn off the hero stuff for good and Thom knows that there's no way he'd let him join The League. Throw in a zany cast of outcast potential superheroes, a dark stranger following Thom everywhere he goes, and a disappearing mom and you've got Hero. The book has issues to spare... family issues, abandonment, sexuality, and characters facing death every other day (and those are just the ones I can name without spoiling stuff...)... Through it all, Thom is learning to trust who he is, to show who he is, and to see beyond the faces that everyone else shows the world. Altogether, I loved the book. Follow this one up with The Amazing Adventures of Kavalier and Clay by Michael Chabon. 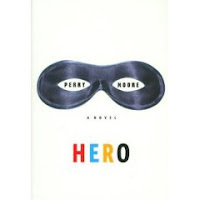 Hero's also been reviewed by The YA YA YAs, Oops...Wrong Cookie, and Professor Nana. Plus, over at Seven Impossible Things there's an interview with Roger Sutton talking about the book. PLUS, YOWZA. No wonder he's a Hot Man of Children's Literature (#32). Thanks for the link. I've been enjoying reading through your past posts. And to be honest, my friends and family will like this as well since I'm finding some books on your blog that I hadn't heard of but would like to read.